She probably thinks she’s in The Great Gatsby. I think her dress had an accident with the shredder. The sad thing is that her (Kara Tointon?) dress is LOVELY, but it’s been completely ruined by those weird dripping sections of fringe. That is not what dresses actually looked like in the 1920’s, and there’s a reason for it: it’s ridiculous. Also, the 1920’s obsession thanks to Great Gatsby is a bit annoying. I feel like it crops up about every three years in Fashion, and while I get that the 20’s were glamorous and romantic and full of preposterous wealth, they also collapsed pretty spectacularly. The Jazz Age does not last forever. It’s a fantasy–which I suppose is why Fashion is so obsessed. This reminds me of a Gaga look in a bad way. 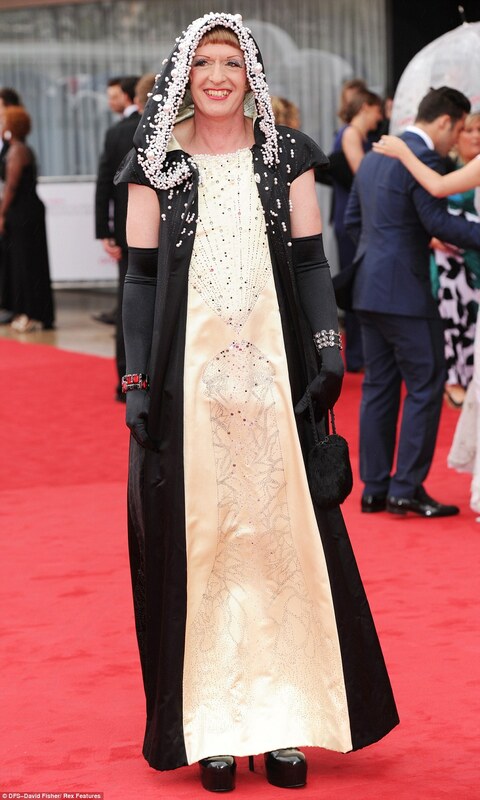 This is apparently Grayson Perry, and I have no idea who she is, but her hood has a pearl-related fungal infection. She also has spangly eye shadow on, which is making me throw some pretty intense side-eyeing her way. And lastly, we have a jumpsuit in two different fabrics, both of which are a frankly alarming shade of pink. If you did not read that sentence in Benedict Cumberbatch’s voice, I am disappointed with you. It is also an alarming shade of unflattering, but since it’s a jumpsuit, we all already knew that. Maybe it’s the obvious change in fabric, but the corsetry on the top cutting her off where it does is not doing great things for her figure. She needs something slightly longer waisted to 1) not look like she’s extremely short-waisted, and 2) not have an epic fabric-based muffin top. That jumpsuit is committing some serious crimes against her figure. See you all tomorrow. NOTE: I have NO IDEA why this didn’t go up at 8 a.m. I agree with you on everything. Such a shame about the first dress! Just an FYI Grayson Perry is a man! Well, now I feel slightly bad about choosing to blog about him. The cape is still infested with pearl-fungus, though. True slightly better than some of his other out fits however! !